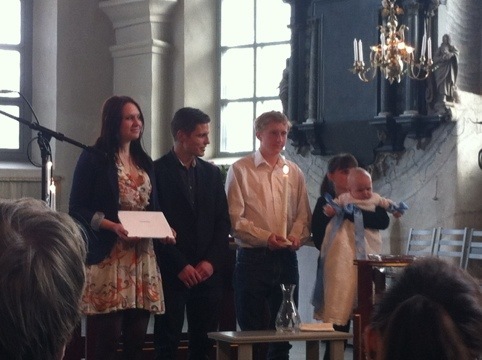 Yesterday I went to the baptism of Mathias’ niece son, Charlie. Mathias is on a work conference in Budapest so unfortunately he missed it. Charlie behaved very well and when the priest held him he was more fascinated with the water and clearly wanted to play with it himself. At the end he got a little tired and sad but as soon as he got into his father’s arms he was fine again. I had a microphone blocking my view so I wasn’t able to take any pictures until the end when they lined up in the middle. After the ceremony at the church a yummy buffet was served at Mathias sister’s house for the ~40 guests.